In the late 1950’s, during road construction in the Euphrates Valley of south-east Turkey, many tombs containing the remains of giants were uncovered. At the sites the leg bones were measured to be 120 cm (47.24 in.). Joe Taylor, Director of Mt. 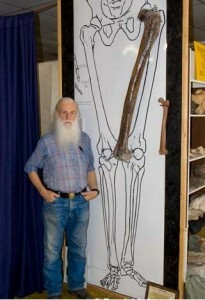 Blanco Fossil Museum, was commissioned to sculpt the human femur. This giant stood some 14-16 ft tall (right). Likely this was a skeleton of a pre-flood person, a time of giant organisms when we know men lived for several centuries. But even after the flood, Genesis 6:4 claims: “There were giants in the earth in those days.” Deuteronomy 3:11 states that the bed of Og, king of Bashan, was 9 cubits by 4 cubits (approximately 14 ft long by 6 ft wide). In Numbers 13:28-33 the Israelite spies investigated the land of Canaan in preparation for an invasion. They reported a race of giants that made them feel like mere grasshoppers. In his 2012 book Giants Against Evolution Joe Taylor cites many historical and anecdotal accounts of giant human skeletons or depictions being discovered around the world. These include red-haired giants of Lovelock, Nevada. These giant mummified remains were taken to the Smithsonian and to the Nevada Historical Society. Oftentimes oddities that don’t fit the prevailing paradigm disappear into the bowels of the museums. Reports on these giants differ, but seem to suggest they were about 10 ft tall. Another fascinating account involves the Patagonian giants who were 10-12 feet tall. The Spanish called the big-footed giants “Patagons,” which became the basis for the region’s name. The tallest person in our recorded history was Robert Wadlow of Alton, IL (above left). 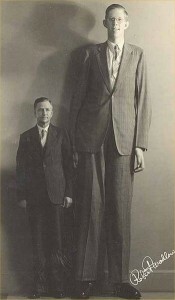 Wadlow was born on February 22, 1918 and grew to be 2.72 m (just under 9 feet tall). He died in 1940 at just 22 years of age and was buried in a 10-foot long, half-ton coffin that required twelve pall bearers! According to the Guinness record keepers, tallest man alive today is Sultan Kösen of Turkey. He was born in 1982 and stood at 8 ft 3 in 2011.